I cant say enough when it comes to Yorkstone pools. Steve, Dino and the team brought my families dream to reality, and then some. Thanks, Richard and Joanne; for taking the time to let everyone know of your experience with us. We know that we are building a pool of YOUR dreams, so listening to your needs makes sense. We are happy we could make it a reality. a walkway and patio at our previous home. Yorkstone Pools quote was a little higher but not the highest. Once we started to dive into the detail we soon realized that you needed to compare apples to apples. We got a better bang for our dollar with Yorkstone. It wasn’t necessarily all visual but what they offered in actual build and structure was impressive. There is quite a lot of planning and important factors to decide on when installing a pool. If you’re like us, we had no clue on what it takes….we just wanted a pool. This is where Steve helped up by explaining all the details and what to expect throughout the process. There were a few delays but mostly due to weather, which we could not fault them for. There were no major hiccups and any that came up, Steve dealt with them graciously and accordingly. All in all, we are extremely happy with the project and enjoy our swimming pool oasis. We would recommend Yorkstone pools to all our friends and family. We thank you for your review. It was our pleasure to support you on this path to pool ownership and are happy to hear that you are enjoying your personal oasis. 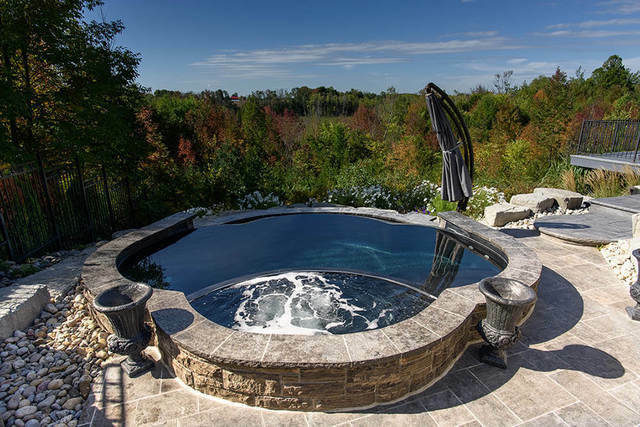 We contracted Yorkstone Pools to install our pool last summer. We were referred to Yorkstone Pools from friends of ours that also had their pool installed by the company. The quality of work and professionalism was exceptional right from the start. Steve worked with our budget but also made sure that all key features were not missed. Steve and his crew paid attention to all of the details that I as a customer would never have known. Patterned Concrete worked with Yorkstone Pools to install our pool deck. Both contractors worked very well together during this phase of the project. 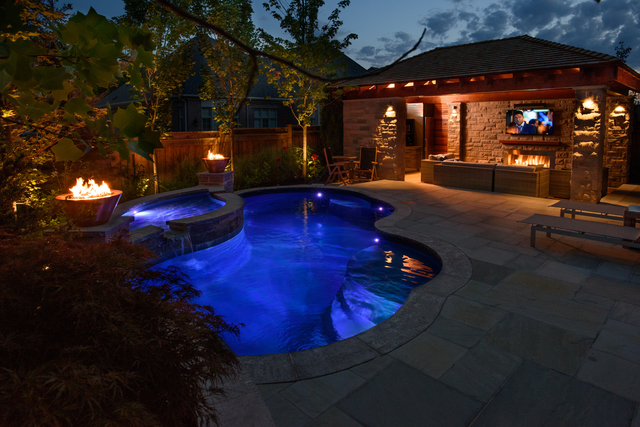 To the crew at Yorkstone Pools, we thank you for making our backyard everything we dreamed of. Your company will definitely be recommended by us. Thank you!! Hello, thank you so much for the review. Glad to hear we provided "top-notch" work. We hope you enjoy your pool for many years to come. We got our pool done by Yorkstone Pools, a job well done. From design, workmanship, products used, to the plants to fit the design our backyard makes it feel like an oasis. We have a small yard so design was critical and they made it work. The staff always on hand to make sure we were satisfied. There was a bit of delay because of the weather but we were well informed about it. We can’t be happier, we gave them a budget and they worked with it. Its our lakeside resort love it. Thank you so much for the kind words and so glad your house looks "richer and better". It was a pleasure dealing with you and have a great summer with your new pool!! After a year of research, we took the plunge and made the decision that would change our lifestyle....we had a pool installed! We had just about enough of packing up the kids and visiting friends and family with pools of their own. We heard multiple stories of the experiences friends had during construction of their pool projects, some better than others. We wanted to make the right choice for our pool contractor. Thankfully, Yorkstone Pools and Patterned Concrete made our experience a very pleasant one. Their package offered everything we needed at a fair price. From design to completion, they took care of the entire project. All staff from both companies worked together like a well oiled machine. Communication between us, management and crews was exceptional. The only downside to the project was the weather. Despite the rain delays, they did their best to complete the project within a satisfactory timeline. We love our backyard and look forward to enjoying it every chance we get. Great job guys!! Terri Thank you for giving us a perfect rating and for recommending our business to other customers. We are glad that our hard work resulted in such a beautiful pool. Take care! I would like to thank all staff and crews at Yorkstone Pools for the wonderful design and installation of our fiberglass pool and Patterned Concrete deck, and not to mention the beautiful natural stone waterfall they constructed. The entire process was completed in a timely manner and all the work looks impeccable. We have received tons of compliments. Yorkstone Pools is worth every penny! I will definitely refer them to anyone looking for a pool. Thanks again Steve and everyone at Yorkstone Pools and Patterned Concrete! Amanda, Thank you for taking the time to review your installation from us. we are very pleased to hear that our staff made your experience great. We previously had a pool at our old house and decided to have one installed at our new one. This was a new experience for us as we bought the other house with the pool installed already. We had looked at several contractors and various types of pools. We decided on Yorkstone Pools because of the easy, no pressure sales approach as well as their association with Patterned Concrete who we wanted to do the decking. If we just look at the pool contract, the price was in-line with what other companies quoted but it was the little things that made the difference such as more reasonable payment schedule with no large up front deposit needed. Some companies wanted 50% on signing and with shady contractors out there, I was not willing to put that much down with someone before they started. Yorkstone had vision and professionalism during the initial meetings with the design where other companies did not give us that warm and comfortable feeling. Their pool equipment basic package was better than the others. Having had a pool previously, I knew what equipment was good and I was surprised at what was included. The package also included a remote control so that we could start and stop the pool or heater from inside the house. Some of the other companies did not even mention these features. A fall closing and this year’s opening was also included. In all, the constructions and installation went well. The project got a little delayed but one cannot control the weather. With their association with very good subcontractors we got a water fall feature installed and a stone BBQ island which we are very happy with. We had a granite top installed on the BBQ Island with our contractor and he stated that he had no surprises or difficulty with the job because the stone work was perfectly level and the angles were straight. I would definitely recommend Yorkstone Pools to others because they provide you with a quality product, vision to come up with designs that will complement difficult yards, flexible, good pricing for what you are getting and employees that were very personable, polite and easy to work with. Yorkstone Pools provided a creative design and superior product that our family will no doubt enjoy for many years. Their price was competitive and the work was conducted in a timely and organized fashion, minimizing any inconveniences. As a first time pool owner, their service technicians are very helpful and responsive to all my needs. Clearly Yorkstone take pride in their work and value the importance of customer satisfaction. This is what we enjoy hearing from our customers. We are just as proud of our work, as you are proud to show it. The pool shell and natural stone coping has been installed, as well as 1000 ft.² concrete surround stamped. The workers did a great job as you can see in the pictures its not complete yet and I will update you once it's completed. Workmanship is great and products used are also top-notch . ????? 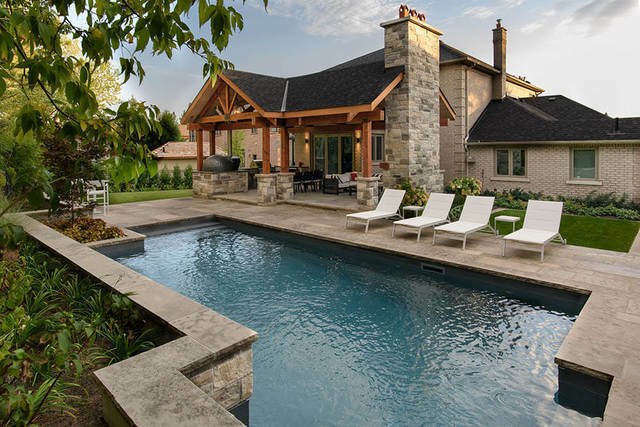 Yorkstone Pools are an amazing company that put their customers first. We interviewed many pool companies and by far YorkStone was not only competitive but offered top quality product and up-to-date pool automation. We are currently in phase 1 of our project with your stone which is planning and development, I will update you as we move along with pictures of the construction process. Steve Italiano was very professional he never put any pressure on us. He genuinely cares for his customers and doesn't use cheap sales tactics. Looking forward to having a pool installed and then a beautiful patio surround. We care, because we know the value of your investment and the work is only as good as the company you hire. We are a premier installer of both custom vinyl and fiberglass swimming pools in the GTA, York, Halton and Peel regions. Yorkstone Pools & Landscapes is a division of Patterned Concrete Mississauga (www.pcmiss.ca), which has been providing customers with unique architectural concrete finishes since 1990. The principal owners of Patterned Concrete have an extensive pool construction background and over the years have been growing the business to become one of the largest Patterned Concrete producers worldwide. Pool & Hot Tub Council of Canada, Toronto Construction Asc., Better Business Bureau, Landscape Ont.